We've only stayed one night, so we didn't get a real good overview of the hostel. We didn't have a very good sleep though, our double bed had a dent. The spring on the doors were strong enough to close the doors with a bang, making the hostel noisy throughout the day and night. Luggage storage was nice. The rooms are not cosy at all. They made me feel a little like I was in prison. The "bathroom" smells dirty (so do the sheets). The kitchen and common room are small, but nice and perfect to meet new people. Staff is friendly. 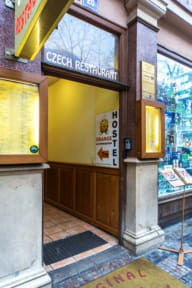 I would recommend this to people who like a great location and only use the hostel to sleep.